Hurrah!!! Let me know where to send your prize to by email and it'll be on its way!!! Now on to the crafty part of this post. Over at The Funkie Junkie blog Linda Coughlin has set a 12 Tags of Christmas challenge that is currently ongoing and is sponsored by the Funkie Junkie Boutique. Each week she is posting a new tag from which to take inspiration and create your own project. Don't panic if you haven't seen it/started yet as there's still time - Linda has set a deadline of 17th December for completing all twelve. Why not pop over to the first one HERE to check on the rules. 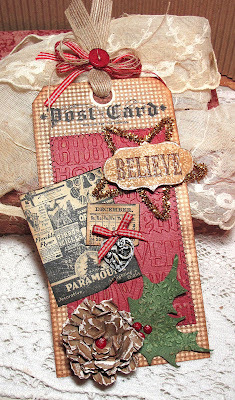 I loved the gingham background and 'postcard' top, the pinecone, the red embossed panel and the use of twine on Linda's tag. The first element to be completed was the kraft glassine pinecone, built by layering successively smaller layers over the original full image. A shout out here to Woodware - you may remember I won a chance to purchase some Woodware goodies from The Stamp Man, and this included the large pinecone stamp. This image includes the pine needles as well as the cone. I didn't want the image to cover the background too much so stamping onto acetate seemed a sensible solution. It also allowed for the addition of the beautiful lace from The Funkie Junkie Boutique, stained with Peeled Paint Distress Ink. Without a gingham stamp the best way to achieve that look was with some Basic Grey paper which was then stamped on and edged with Peeled Paint Distress Ink. This was echoed with green punched leaves covered in Peeled Paint Stickles glitter. Ribbon, twine, buttons and MDF letters completed the tag. I've mentioned previously that my intention with all these Christmas tags is to use them on cards this year, and it seemed a good time to show you how that aspect is progressing (eleven down so far but not enough room to show them all in any detail!) The sentiments are Woodware stamps, purchased from The Stamp Man as part of that win too. By putting them onto recycled kraft cards, the tags retain their handmade feel. What a BEAUTIFUL tag, and I LOVE how you're featuring them on kraft cards. GORGEOUS! Gorgeous festive piece! I love the texture & colours, they make me feel quite excited. A wonderful Christmas tag and they all look terrific on the greetings cards. A fabulous tag Buttons! I love all the texture, the colours and that little pine cone is gorgeous. Love the pictures of your cards too - great inspiration as always from you. Really like how you've used the kraft card. What a clever crafter you are using the bigo folder in that way. It works perfectly with all the lovely details you have included on your tag Buttons! Don't know how you do it (talent probably lol) but you always come up with such amazing and inspirational tags. They do make wonderful Christmas cards too. A really beautiful textured tag Buttons and all the detail is amazing. Sorry to hear you're not well and hope the cold disappears soon. A stunning Christmas tag Buttons...your ideas are so great...everything matches so well! Totally brilliant! I love everything about what you've done here... The pine needles stamped on acetate look fabulous peeking off the bottom, and that pine cone looks just amazing - genius use of the kraft glassine. Wonderful embossed panel with a great patina on the numbers. And your tags look fab on the kraft cards - such a clever way to display and then share your glorious tags! Big WOW! Wow! I LOVE!! all your tags, each one is a masterpiece in itself. Love all the different textures you manage to get on one piece of card. Oooh wow, thanks to random number generator for picking me!!! Another super tag, love the way you've used them on your cards. Oh your tags are gorgeous and youve done so many. I'm going to forward your blog details to my friend Mo in Scotland, she will love your work. ive already told Mo (Twinkle Toes). These tags are just scrumdiddlyumptious! The most recent is my current favourite. I love that you used acetate for the pine come image. Can I ask what ink you used to stamp with please? REPLY to my post Buttons! Thank you I do only say it like it is. No one gives me anything free to promote and I have to love it. Bit like you and the Diffusions Embossing plates which are most certainly in my stash and in the sore :) When I used the other day for a class every lady ordered one! I have rather a lot of pastels of varying prices and qualities and I was skeptical too - until I bit the bullet and bought myself a set as a total treat - whole set bit ouchy but then I figure as with everything - you get what you pay for. Anyway enough waffle - they are lush. Each of those cards took no more than 15 minutes! Sticking it down being the longest time! They must be fixed. I use the Micador fixative for no other reason than I have always used - I had class sets of chalks for YEARS! WOW!!! FABULOUS!!! I love that you are putting these on tags! Brilliant! They are going to be a joy to receive! Hi Buttons. All the tags together look mighty impressive - so beautifully done. I love your latest tag/card - pine cone and needles especially are fab. I've been afraid so far to ink the venise lace in case I ruin it but seeing how well yours turned out, I think I'll be trying to ink sone soon. Full of festive joy, really gorgeous. Buttons, that is lovely of you to thank FSC! Beautiful Christmas tag! Love the countdown embossed panel and the leaf topping! Fabulous! Wow, wow and wow again! This is absolutely FABULOUS, Buttons! You have some much goodness happening here, so many things I love - the glittery leaves, the hexagon JOY, the pinecone, but most of all the way you used the BINGO texture fade. This is an absolutely brilliant tag. Love how you showed us the line up of all your tags/cards so far - a gorgeous lot for sure! Thanks so much for playing along! What a lot of stunning texture! The Bingo fade looks so rich this way, and I love how you did the pinecone.